On Tuesday the 6th of February, trading on the euro/dollar pair closed slightly up. The euro dropped to 1.2315 before recovering to 1.2404 (+89). Turmoil on the US stock market subsided to help euro bulls recover their losses. At the end of the day, the indices closed between 1.7% and 2.3% up. My expectations of a drop to the 135th degree came off perfectly. Now we turn our attention towards today’s session. In my intraday forecast for the week running from the 5th to the 9th of February, I’ve got a phase of growth starting on Thursday. Since the low on this model has been reached, today we should see a reversal form. Still, we shouldn’t rule out the possibility of returning to 1.2340. With reversals, we can often see rather deep corrections. Moreover, the dollar is getting an extra boost from the growth in US 10Y bond yields. Meanwhile, the fact that the political parties in Germany still haven’t managed to form a government is weighing down on the euro. Talks were supposed to come to an end on Monday, but didn’t. The parties are struggling to find a compromise. In my forecast, I’m expecting a drop to 1.2365. The 45th degree is sitting at 1.2348. Since we have a mixed picture on the euro crosses, I’m allowing for the possibility of a drop to here. Buyers left a long tail on the daily candlestick. Since the session high was reached before the low, my forecast is predicting a breakout of the trend line, followed by a jump to 1.2426. I’m not entertaining the idea of the euro going any higher than the 90th degree today given that the phase of growth isn’t supposed to start until Thursday. Today, as trading in Europe is soon to get underway; the single currency is trading at 1.2308 against the greenback, marking a modest rise of 0.16%. In the wake of these small gains, the US dollar index has slipped by 0.13% to trade at 89.89. The euro has been slowly rising against the dollar since it rebounded yesterday from the 1.2240. There aren’t any statistical publications due from the Eurozone or the US today. At 12:30 (GMT+3), the UK will publish inflation figures for January. The consensus is that annual inflation in January will drop to 2.9% from a value of 3% in December. Although this forecast falls in line with the Bank of England’s expectations, today’s figures could increase volatility on the pound at the time of publication. 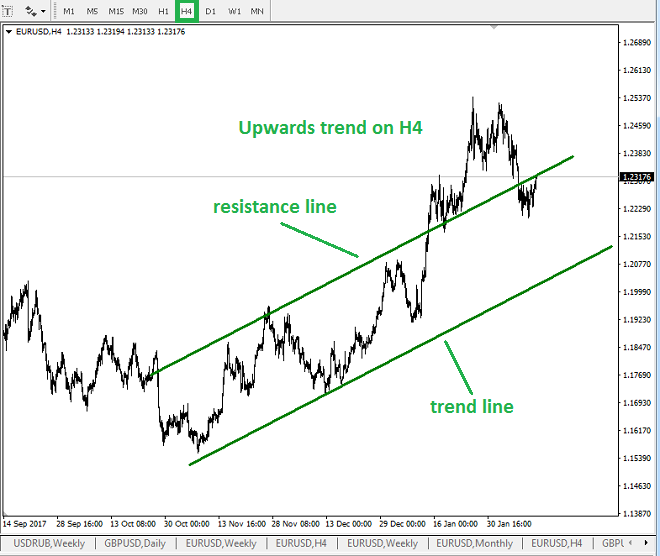 This resistance line of the upwards trend has been holding up the euro from rising further against the dollar. If the euro successfully exits this range, it should rise at least as far as the low within the double top formation on the hourly timeframe, i.e. 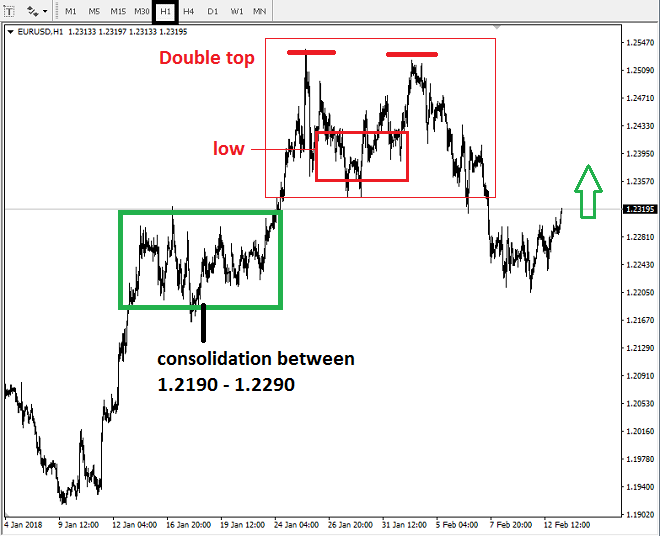 to around 1.2345 – 1.2385. 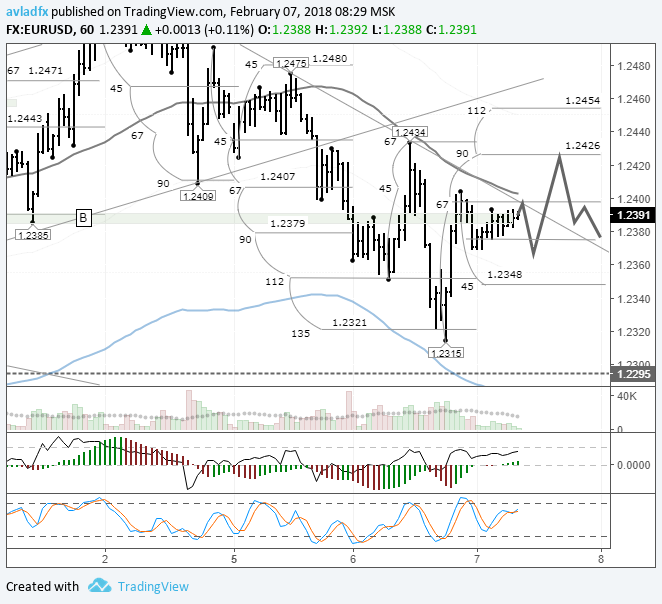 At the time of writing, the EURUSD pair is trading at 1.2318.